For quick and easy product importing, you have the ability to upload multiple products at once. Scroll down to the "Import" half of the page and look for the Products section. 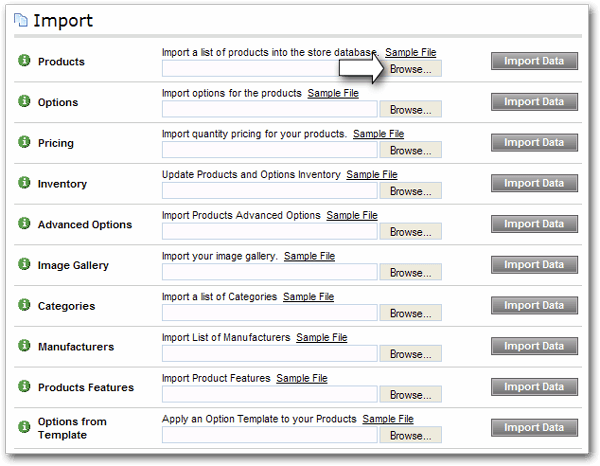 Click the "Sample File" link that appears next to "Import a list of products into the store database" above the Products field in the Import section. A File Download window will appear. Click Open. The sample file will download. You may now begin adding product information to the appropriate columns. To get details on what each product field should contain, see this article. Ensure that all required fields have data. Once you have filled in your information, save the file to your computer. Tip: When saving the file in your spreadsheet program, select the "Save As" option and be sure to specify the CSV filetype as "CSV(MS-DOS)." If using a Mac, save using the "CSV (Windows)" option. Most spreadhseet programs contain this option and it will ensure your CSV file's formatting is fully accepted by the 3dcart store's import system. Browse for your file in the Products field in the Import section. Insert Only: This will insert any new products that are not currently in the database. It will not update any product information. Update Only: This will update any information that is currently in the database. The information in this csv file will override what is in the database. Insert + Update: This is a combination of inserting and updating. The system will insert any new information and update any existing information. Erase All products, then insert: This will completely remove all the product information from your database and then insert the information. Please read the warning and make sure that this is what you want to do before using this option. Note: If you are choosing Update Only and you have columns of information you did not fill in, be sure to delete the unused columns. Important: This product import does not allow for importing Product Options (Sizes, Colors, etc.) with these products. The options import is a separate import. All products must be imported prior to importing any options. Read more information on this here.